And, it's a workable solution now, based on my experience with Google's Voice Search on the Android platform that I blogged about yesterday. Once you can reliably use speech recognition on a mobile, the issues of small keyboard and small screen, even on a netpad computer, vanish. The most important aspect of this is that it changes how you think about finding information. I was lying in bed, and for some reason I was thinking about my sister's wired haired terrier, and I remembered that her vet said the dog may have a form of Cushing's Syndrome. At that moment the term "canine cushing's syndrome" popped into my head. I did the voice search on the HTC Hero, and sure enough the first hit did come up with a Web page devoted to this subject. I quickly looked it over, and it seemed to be well research, so I chose to send the link to my sister via e-mail. All this was done within minutes. If I had to type this search term using the Hero's virtual keypad, I wouldn't have done the search. Besides performing Web searches, this potentially could be used by patients to record symptoms, or ask questions that could be sent via e-mail. Of course, you still have the issues of privacy and confidentiality, but encrypted e-mail is already available. Another aspect of this is that more Web sites will have alternative mobile sites that render well on small screens. This is long overdue, perhaps because it limits the number of ads that can appear on the page. Adobe Flash is another problem for the mobile Web. Eventually it will be universally supported, but here you run into the problem of overloaded cellular networks by power users watching videos. I think all this points to the fact that soon smart phones will look and act very differently in the near future, as well as changing how people approach information management and communication. Twitter's newest rival Plurk is down now, and I far as I can tell it's been down since 2 AM. There's no news to be found about this by Googling. Technorati is having it's own issues. Looks like Web 2.0 has some scaling issues when it comes to microblogging. UPDATE: And, Amazon.com is down. Social media on fire or going down in flames? I've been trying out various services and aggregators recently. Let's see I've done Twitter, Pownce this lets me embed files. You can use TwitPic to make it easier to upload photos and post links to Twitter. Twitter is what most people with extensive networks have latched onto for the 140-character hyper-social, noise/news/buzz/juice they need on a constant basis. You can pick up some decent conversation about breaking news, but instant analysis is not always the best. Then for social media aggregators, you have Twirhl, an Adobe Air-based client for Twitter and FriendFeed, another aggregator (seems circular, I know). It also allows you to post updates to Pownce and Jaiku. Jaiku, bought by Google, allows you to post your "activity stream" (I'm eating breakfast now), from your PC or your phone. But, you need an invite to participate as a beta tester. Now Twirhl was purchased by Loïc Le Meur who also has Seesmic in alpha. Anyone can sign up for a Seesmic account and it allows you to record and video and then upload it where it is then converted into a Flash file (flv). The idea is to be able to have a conversation with the other folks posting, and all the videos are listing in a vertical, scrolling timeline. It's hiccups from time to time, hey it's alpha, and people are complaining, but they seem to be making progress with accommodating the growing crowd of users. The downside of Seesmic is that it's difficult to quickly look at the content of a long list of posts, or even find an interesting conversation that you knew occurred recently. They don't have tagging yet, which should be the answer to this problem. But the question remains, why have video if you're just conversing? Text is so much easier to post and scan later. It's not clear where this service will be going. Some educators are thinking that it would allow students to interact with faculty in a more personal fashion, and other ideas are being proposed such as making it a dating site. Which brings us to Plurk. A number of Seesmic users frustrated with the glitches joined the other newcomers at Plurk. It's another 140-character service, but you can embed YouTube videos and Flickr media. The social media cognoscenti are miffed that they can't import their network of followers into Plurk. It's essentially starting all over again, unless of course, you're Scoble or some other big Web wonk. I didn't even touch upon Marc Andreessen's Ning, a service that allows people to create their own forums for discussion usually surrounding a particular topic. For my MySpace is something I never really used, and Facebook and Linked In seem like relics now. They don't have the spontaneity of what I call the hyper-social services. Even Flickr is more useful for sharing interests with others, but then you have to be a prolific photographer. You're beginning to see why a new service such as Plurk can make some people very nervous about having to manage all these feeds. My impression is that most would really rather see Twitter finally scale up to the point where there is no down time. But its competitors are coming online, and uncertainly abounds, but I think we'll have to live with this mess for a while. 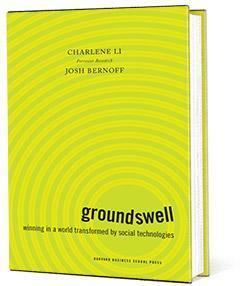 "Groundswell: winning in a world transformed by social technologies" is the new book by Charlene Li and Josh Bernoff, of Forrester Research. I found out about it from a press release for a presentation by Josh sponsored by the MIT Enterprise Forum. While I mostly write about wireless technology, I think it's just as important to talk about the wetware: the social forces that influence how people decide to use technology. The book does cover case studies where health care companies have implemented Web-based methods of surveying their customers. 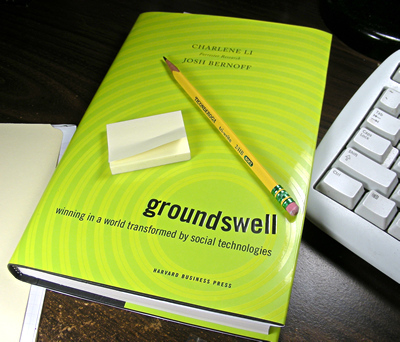 Groundswell? I guess this metaphor for expansion is safer than Web 1.0 bubble imagery. I mean, you wouldn't think of a groundswell bursting. I can't picture a groundswell, and it's not the most mellifluous word, but I guess works as a unique term you can position high in Google's Page rank. We wanted to give our clients, and the world, a clear perspective on the whole trend, not just pieces of it, with a clear set of strategic recommendations. The book begins with the story of Kevin Rose, the creator of Digg, specifically one day just under a year ago when a blogger posted the secret encryption key for HD-DVDs. It started to gain importance on Digg, but the lawyers coaxed Kevin to remove the link to this blog. However, by the end of the next day, 3,172 blogs had mentioned that number. Point: you don't have an undo button for the Web. The book goes on to talk about the importance of relationships. It's mostly about how folks decide to buy things through word of mouth rather than caring about the company's grand branding efforts. They explain blogs and RSS. I would think that if you didn't know about these you're hopelessly behind the learning curve, and should spend my time on the Web instead of reading this book. Next, we come to the Social Technographics Ladder (STL). These are the Creators, Critics, Collectors, Joiners, Spectators and Inactives who comprise the social networking food chain in order of decreasing involvement with online forums. The authors then look at the online support groups for cancer and obesity patients. They appear to play an important role even though these patients don't populate the higher end of the STL. They state that health care companies are hampered by a heavily regulated industry that in a way that "put[s] the brakes on the kind of free innovation in marketing that most ordinary manufacturers can employ." Another reference to health care is made in discussing who determines a company's reputation. M.D. Anderson is rated number one by US News & World Report annual listing of cancer treatment centers, and they pride themselves in upgrading their technology to include the latests in cancer treatments, but in reality patients have decided to go to other centers because of the up to 4 hour wait during treatment sessions. This cancer center finally decided to hire a company to produce and manage a private community of cancer patients to discover the real issues these patients are concerned about. In another section Memorial Sloan Kettering is used as a case study where they similarly wanted to find out what their patients where thinking. They couldn't justify the expense of hiring Communispace which charges $180,000 for the first six months, and $20,000 per month after that, but they were able to convince the National Comprehensive Cancer Network, of which they are a part, to pick up the tab and use it for the entire network. Another case study is Masschusetts General Hospital which offers something called CarePages. It's a blogging tool that can be read by invitation only, and meant for patients or their close family members to post updates on their hospital course so that relatives can keep informed and respond. This book isn't an exhaustive review of social networking. It's mostly a how-to guide for businesses either to blog or to create forums so that they can keep tabs on their brand. Facebook is given a few pages, and Twitter ever fewer. I think the biggest flaw is that the authors don't look beyond Web 2.0 to future trends that will bring us closer to the much vaunted semantic Web. NYC MIT Enterprise Forum: "Riding the Social Media Groundswell"
The MIT Enterprise Forum of New York City is hosting an event on May 15 in midtown NYC, "Riding the Social Media Groundswell," featuring one of the authors of the upcoming book "Groundswell: winning in a world transformed by social technologies" (Harvard Business School Press). These are some of the specific areas that Josh is examining. MySpace is worth "between $6 billion and $10 billion"? Basically, it's an answer in search of problems. It's overhyped and doesn't deliver much. It's about people, not about ideas. I haven't been able to find someone who was willing to explain the point of using it. And all those Facebook apps...who cares about the endless ways to shuffle around information and media? MORE: It's hard feigning interest in people who contact you. "Hey, great idea!" I'd rather not be in the position of rejecting people either. Then there's the problem of having to check in to see if you received any messages, and then having to answer them. I'd rather spend the time supporting the close relationships I already have. 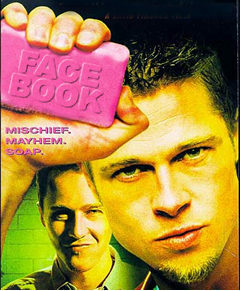 Jason Calacanis has already declared Facebook bankruptcy once. I guess you can justify the time and energy if you have something you need to promote to a wide audience who are led to believe at the same time that you're their "friend." I think you run the risk, however, of turning your relationships, or you, into a commodity. Facebook may work for a small group of people in one environment, as in a college or workplace. But, with the weight of 40 million subscribers and growing at a rapid rate, I think it won't last. I been asking people how they use Facebook, and while some where reluctant to talk about it, I beginning to get some tips. My Facebook entry.